Rebecca and Joe did not part on the best of terms. They were at university together along with Rebecca’s boyfriend Olly who she later married. They were an inseparable trio until one drunken evening, whilst Olly was ill in bed, Joe declared his true feelings of love for Rebecca. After spending the night together, she is racked with guilt and leaves. After a rocky time, she and Olly (who never knew about what happened) make a commitment to each other and get married. Blissfully happy, they sort of forget about Joe and life could not be better. That is until the fateful day when Rebecca receives a visit from the police who inform her that Olly has been killed in a motorcycle accident. This happens at the start of the story and leads to Rebecca, who also discovers that she is pregnant, moving back to her home time, where Joe is also running a wine bar. The two meet and the rest of the book chronicles how their fragile relationship starts to mend and grow as they get to know each other all over again. It’s a wonderful story that had me hooked from the very first pages. 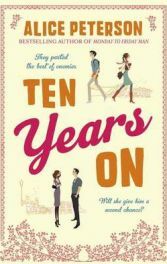 Ten Years On is a book that really highlights the value of friendship and I found myself really warming to this theme throughout the entire book. Rebecca forms many different friendships as she attempts to rebuild her life. I liked the way she and Joe gradually became friends but the one that I enjoyed the most though was her friendship with Janet, an old lady with little sight, who understands exactly what Rebecca is going through, having also lost her own husband. I loved reading about the strength of this friendship that was both poignant and funny. I really enjoy Alice Peterson’s style of writing as she reveals little morsels about the main characters bit by bit. In this book, she alternates between the present and the past so that the reader is slowly able to piece together what happened all those years ago between Joe and Rebecca. She also creates wonderful characters that you can slowly get to know and come to care about. Ten Years On also explores the theme of bereavement but not in a heavy mournful way. Rebecca is obviously very upset and lost after the sudden loss of Olly and it’s interesting to see how she is treated by various different characters. Her family don’t quite know how to treat the young grieving widow and others think that she is lucky that she is still young enough to meet someone else! I think it just goes to show that there’s no rulebook or timescale as far as bereavement is concerned and Rebecca copes in a way that suits her at that time. Ten Years On is not a sad book though. In fact I found it very enjoyable and quite uplifting. It’s another great book from Alice Peterson. My thanks go to the publisher for sending me a review copy. No Comments on "Ten Years On"